I've mentioned previously how I often look for old books at Flea Markets, car boot sales, junk shops and so on. I bought a couple of books today for the princely sum of £1 ($1.40) for the two. 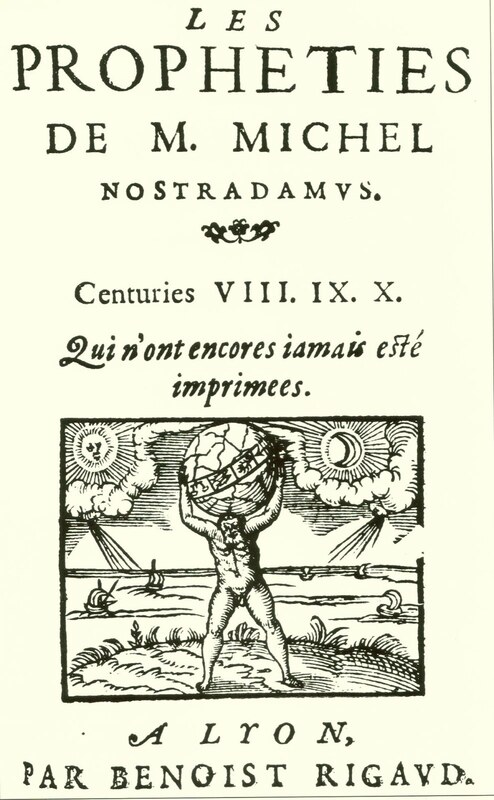 One wasn't particularly old but had the title of Nostradamas: His key to the centuries and had prophecies for the period 1995 -2010 but was published in 1994 and supposedly written by Valerie Hewitt in 1992. 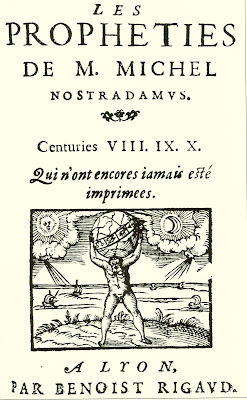 So often Nostradamas prophecies are shown after the event, with his words made right to prove his effectiveness. This book was different as it has proper predictions made in advance. Political Rights for Animals and the quote: "After the year 2000, animal rights will be a part of the new culture." The book's author writes that there will be a new attitude to animals which will be "enshrined in political legislation." Recently I have been reading in the press about how there have been suggestions that there should be a bill of rights for animals and in particular dolphins. There's an example of this in the Daily Mail here. One of the Nostradamas prophecies, according to the book, was also that, "After the year 2000, there is a hard effort to understand via phonetics the speech of dolphins saved from toxic seas that kill tune fish; but success comes through searching for waves." This reminded me of a post I had seen on Trish and Rob's blog synchrosecrets which has a video of thousands of dolphins fleeing the California coast. I actually left a comment on this post about how I had read in newspapers about legal rights for dolphins. So maybe this is a Nostradamas prophecy that will be proven correct. There was another bit to this particular prediction that doesn't appear to be true, as yet. To quote author Valerie Hewitt, "The final phase is extraordinary. It suggests the rise of an extreme, militant vegetarianism as at the beginning of the millennium. Just as smokers nowadays are rapidly becoming social pariahs, so people who cook and eat meat will be reviled, regarded as mad killers." I'm a vegetarian, though far from militant (my wife eats meat) but vegetarianism does seem to be spreading. Most restaurants have veggie options nowadays - at least in the UK. I have this feeling that to be truly spiritual (I'm far from being this) it might be necessary to give up eating flesh. You can't really imagine, say, someone like Jesus tucking in to a bloody T-bone steak can you? I have a blog post asking Was Jesus A Vegan. Going back to the book I bought I have only flipped through it quickly and it does seem that there are a few wrong prophecies, or maybe the dates are incorrect. One I did notice as perhaps being well on the way to being right was the question of bookshops. The author writes, "Will bookshops disappear? Publishing could be using new technology capable of producing books at a breathtaking rate." This was said back in 1994 and now the likes of Kindle are taking over from 'proper' books and bookshops. I hope this doesn't happen, though it most likely will. I love bookshops and hunting for old books. They give a special something that Kindle can never reproduce. I don't understand much of it either, in it's original format. You're right about how so many of his prophecies are interpreted after the fact. But this book sounds fascinating. How things would change if dolphins, for instance, had legal rights! Thanks for the mention, Mike! I reckon it'll be a while yet before any such rights a come about, but you never know. Maybe the militant vegetarianism he's referring to are organizations like PETA. This is really a nice article.. I agree with the Jesus being a vegan part, because you simply can not imagine a spiritual leader to be flesh eater (the message of peace and harmony wont make sense then)..